After a week spent ogling gorgeous Nashville and New Orleans gardens, POD returned to news of staggering heat, hail, and thunderstorms, understandably worried about what was to be discovered on deck. Thanks to Startin’ Yer Garten’s loving hands, though, cats and plants all fared well. Although things look pretty good, a little trimming is in order. As summer cooks up, certain leaves (like certain gardeners, despite repeated applications of SPF 50), start showing their age. Like freckles, it’s just a fact of cucumber life: the lower leaves will eventually shrivel into dessicated skeletons of their younger selves. Rather than fretting about all that could be amiss, POD opted to take a see-no-evil approach: the trim. Knock on blue wood, there doesn’t appear to be any evidence of pests, fungi, or mildew (yet). 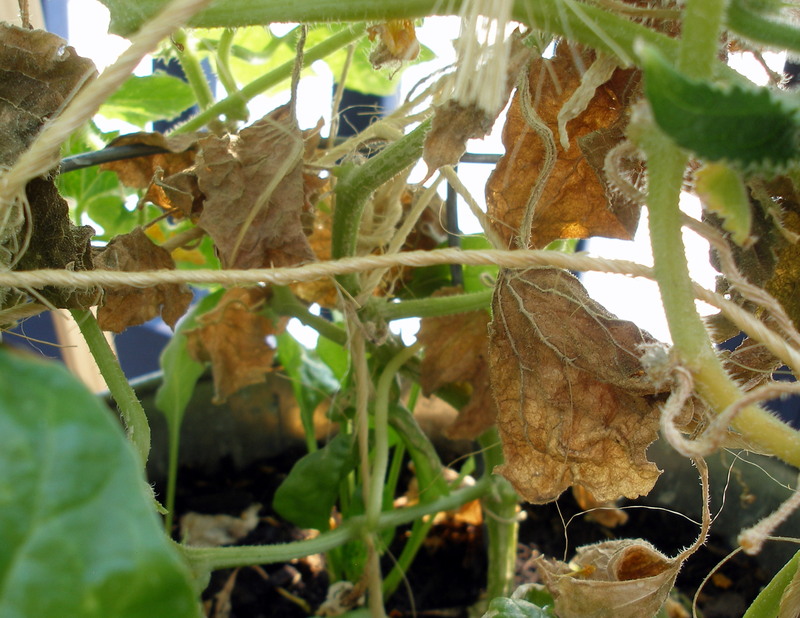 So, to increase air flow (an important consideration in preventing the aforementioned cucumber ailments), the older leaves are snipped and carefully removed from the deck.